Lotta Edström has had a passion for animals and nature since childhood. One of her first meetings with an animal was when she quickly crawled into a pasture to meet a horse. Her mother, who was scared of horses, had to go in and get her. Later she got to know all the neighbors’ dogs and took them for walks and took care of cats that showed up where she lived. She loved to be out in the nature climbing trees and mountains, swimming in lakes and looking for frogs. The horses started to play an important role in her life from the time when she started to read and she received a card from her parents. She was asked to read the written sentence which said “You may ride”. She read it and was delighted. She started to take riding lessons and for some years she spent a lot of time with the horses: riding, taking care of and loving the horses, being in the stable as much as possible together with her best friends. When she was 14 years old, it was decided that she and her family were going to move to another town. To say goodbye to “her” horses and friends was a very sad experience. In the new town Lotta continued to be with the horses at a new stable and took riding lessons but it wasn’t the same and she spent less and less time with them. And when she was 15 years old she became allergic to horses, dogs, and cats which resulted in not taking riding lessons, and the cat the family had at the time moved to another family’s home, and there was sadness again. There was a time during her teenage years where life was not so easy. Lotta started to travel when she could and loved to see different places. She lived in England as well as in France working in families and taking care of children. She had an interest in helping people and it resulted in studies and a degree as a social worker. In 2000, the animals started to come back into her life. Lotta and her family, husband and two young children, had had a very tough year as her husband became severely ill with cancer and she felt she needed a break in her everyday life. She decided to travel to Egypt to meet a dolphin that had become a friend to humans and who used to come into a bay and swim with people. The meeting with the wild dolphin and the dolphins baby in the Red Sea was a huge change in her life. She came up from the sea with a big smile in her face and felt that she could feel real happiness again. And the dolphins became a new love in her life. After the meeting with the dolphins, Lotta Edström got involved in a non-governmental organization for protecting the dolphins and whales. She also started to take more care of herself and her health. She attended a course in mindfulness MBSR and she also started to meditate on a more regular basis. She got the opportunity to participate in a FEEL (Facilitated Equine Experimental Learning)® workshop with the horses as teachers through a friend who also had a great interest in dolphins. 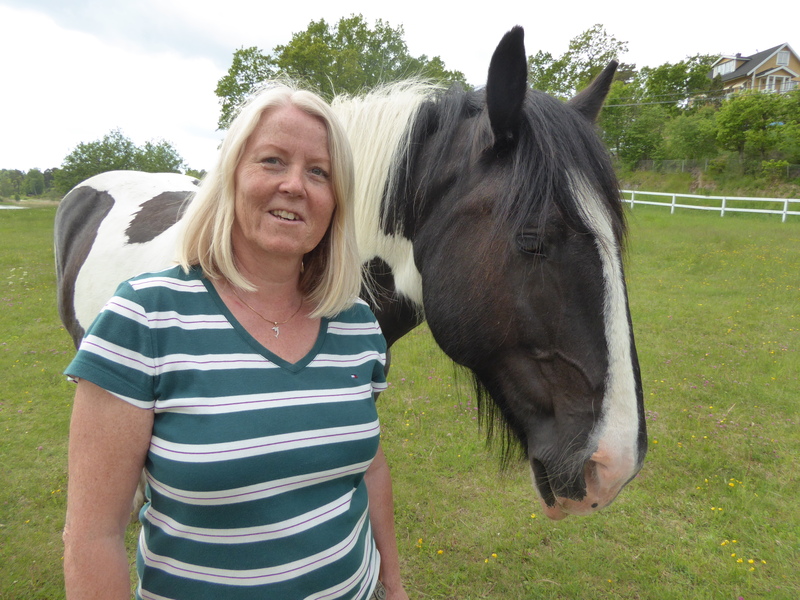 The experiences she had during the workshop opened up the possibility to have horses back in her life. After some time, she also found out that she did not longer have any allergic reactions when meeting with the horses, and that was fantastic. Lotta Edström has a long professional experience as a social worker/counselor in different areas with both children and adults. She has been working with families with children with neurological problems, with adults with chronical pain and adults with acquired brain damages. She also worked with refugees and with children and youths, and their parents, with psychosocial difficulties. She has further studies in basic training psychotherapy in psychodynamic and cognitive orientation, as well as studies in psychosocial treatment in system theoretical orientation and in methods for working with families such as Beardslee’s family intervention. Lotta Edström is a graduate of Horse Spirit Connections FEEL certification program (2017) and is holding individual sessions and workshops with adults and young people. She feels passionate about bringing horses and people together to open up the magical experiences that happens in relationship between people, horses, and nature. Lotta Edström invites you to have your own experience with FEEL – an opportunity that can help you to gain self-knowledge and acquire skills leading to positive life changes. Lotta Edström welcomes you to contact her for more information.